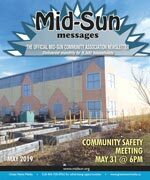 The Community Association of Mid-Sun provides representation for the residents of both Midnapore and Sundance. The Mid-Sun Community Association was founded in 1977, and serves the 18,000+ people residing in the communities of Midnapore and Sundance, as well as other residents of south Calgary. The current facility was built in 1987; expansion plans are currently undergoing review. The Mid-Sun CA is a founding member of the South Fish Creek Recreation Complex, and a member of the Trico Family Leisure Centre. Representatives from the Mid-Sun CA sit on the governing boards of both of those organizations. The Mid-Sun Community Association strives to offer accessible recreational programming, and a venue for fostering community spirit. The success of the Community Association is due to the efforts of a great many volunteers, and residents who support the association. In the City of Calgary’s 2012 municipal census, Midnapore had a population of 6,861 living in 2,726 dwellings, a -0.4% increase from its 2011 population of 6,888. With a land area of 2.9 km2 (1.1 sq mi), it had a population density of 2,370/km2 (6,130/sq mi) in 2012. Residents in this community had a median household income of $62,067 in 2000, and there were 10% low income residents living in the neighborhood.As of 2000, 12.3% of the residents were immigrants. A proportion of 14.3% of the buildings were condominiums or apartments, and 25.8% of the housing was used for renting. For more detailed info visit the City of Calgary community profiles site.